02 May Will Newfoundland kill Nova Scotia’s 50-year energy plan? The Muskrat Falls hydro project in Labrador is the mainstay, keystone, and linchpin of Nova Scotia’s energy plan for the next half century. It promises enormous benefits for us—and for Newfoundland—in a setting where no practical alternative exists. Without it, the mainmast snaps, the arch collapses, and the wheels come off. That’s why last week’s reckless blustering by Stan Marshall, newly appointed CEO of Nalcor, Newfoundland’s troubled government-owned energy corporation, about possible cancelation of the half-built project, ought to alarm Premier Stephen McNeil. Muskrat Falls is an 824 megawatt generating station on the Lower Churchill River in Labrador. New transmission lines, including two undersea links, will connect it to Newfoundland and Nova Scotia, and thence to New Brunswick and New England. 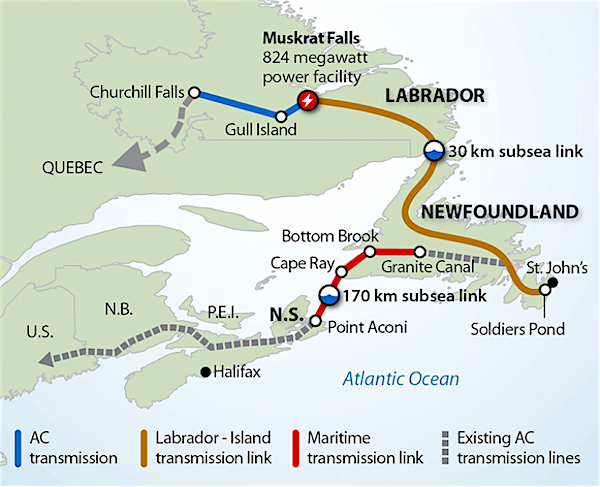 An additional line will connect Muskrat Falls to Labrador’s Churchill Falls generating station, and from there to Quebec and the rest of North America. This new power loop will, for the first time, give Newfoundland and Nova Scotia a robust connection to the North American power grid. With that will come access to market-priced electricity when local sources are unavailable or overly expensive (as they have been for much of our recent history). This represents a huge change in our energy regime. Newfoundland currently enjoys no electrical connection to the rest of the world. Nova Scotia has only a slender connection to New Brunswick along a power corridor so congested with electricity bound for Moncton and PEI as to be all but unavailable for delivering electricity to Nova Scotia. In return for building the 124 km Maritime Link under the Cabot Strait, Emera will get enough power to close most of Nova Scotia’s remaining coal-fired plants, an eventuality Ottawa forced us to plan for even under the climate-change-skeptical Harper government. Getting off coal means Nova Scotia power consumers will no longer be sending hundreds of millions of dollars a year to sketchy mine operators in countries with dubious labor laws and human rights records. Replacing coal with hydro will increase the amount of fuel-free wind power we can add to our system. Wind turbines require backup power for times when the wind isn’t blowing. Coal plants can’t provide that backup because they turn on and off too slowly, but hydro makes an ideal backup supply. Newfoundland’s new connection to the North American grid will enable it to close the decrepit, 45-year-old, oil-fired plant at Holyrood, which is long past its best-before date. It opens the way to continued development of Newfoundland and Labrador’s vast, untapped wind and hydro power potential. Ultimately, power from Muskrat Falls will help us bridge to the day, decades from now, when tidal power becomes an economical source of electricity. When that happens, Nova Scotia, as custodian of the largest tidal power supply in the world, will become a green energy behemoth. Unfortunately, the new Liberal governments in Nova Scotia and Newfoundland have both focused on the short-term political goal of finding fault with their predecessors. In Nova Scotia, this meant pre-election pandering to public hatred of Nova Scotia Power with invidious criticism of everything from Muskrat Falls and the Maritime Link to energy conservation programs and rate increases caused by greening the grid. In Newfoundland, lower oil prices have slammed the economy twice: decimating offshore oil revenues and curbing remittances from oil-industry workers who travel back and forth to Alberta. That led to a fiscal meltdown, and a provincial budget filled with tax increases and service cuts. Premier Dwight Ball thought it clever to blame the mess on cost overruns at Muskrat Falls. To reign in those cost overruns, Ball brought in Marshall, who, as CEO of a rival energy company, Fortis Inc., had publicly opposed Muskrat Falls. Within minutes of his appointment, and before studying any of the the complex, multi-party contracts governing the Muskrat Falls and the Maritime Link, Marshall was musing about killing the half-built project. Next: How serious is Marshall?